"BDS" campaigners widely trumpeted their latest "success" - only for it to be revealed as false. Pro-Israel activists have derided the Boycott Divestment and Sanctions (BDS) anti-Israel movement, after a widely-trumpeted "success" in their campaign to isolate Israel was revealed to have been fabricated. In the last few years, anti-Israel activists have embarked on a campaign to isolate the State of Israel politically and economically, calling for international boycotts and sanctions against the Jewish state. 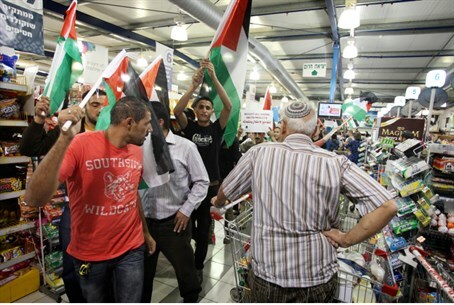 Having failed to convince major investors to divest, and in the face of a continuously-strengthening Israeli economy, the movement has largely focused its efforts on small, symbolic battles against Israeli companies which manufacture products such as snacks and beauty products. But it seems that even that tactic isn't quite working. Last week, Electronic Intifada, a blog aligned with the BDS movement, announced its latest "victory," claiming that Delta Air Lines had decided to stop serving a snack produced in the Barkan Industrial Zone, due to its location in Samaria. Electronic Intifada claimed that the decision was made after a complaint was lodged by a member of the far-left "Coalition of Women for Peace," publishing what it said was the text of an email in which the airline said that it would be dropping the product. The blog's editor, Ali Abunima, claimed that "Delta Air Lines lawyers ruled that Israeli settlement-made snacks should not be served." Veteran Israeli activist Avi Mayer, however, was unconvinced, and promptly discovered that claims of a boycott were completely false. In a letter to Mayer (which he promptly published on his Facebook page), the airline explained that the snack in question - a vanilla halva bar - had indeed been removed, but only as a result of "a normal catering cycle and review," in which the in-flight menu regularly changes. But there was more. Not only were reports of a boycott unfounded, but Delta's representative explained that more than 1,000 Israeli-made items are "sourced by our local caterer," adding: "the snack (fruit) that replaced the bar is grown locally in Israel. Delta makes a practice of sourcing local goods for catering in most international markets we serve." Speaking to Arutz Sheva, Mayer said he saw the revelation as proof that the BDS movement "has reached the point of desperation," pointing to a number of similarly fabricated claims of BDS "success." "Their efforts continue to rack up one devastating failure after another, and so they find themselves scraping the bottom of the barrel and, when necessary, simply making stuff up. This has happened time and time again," he said, noting that "it seems to be happening with increasing frequency." "When singer Lenny Kravitz cancelled a trip to Israel last year, BDS activists hailed it as a victory. It didn't really matter to them that Kravitz has said clearly that he was cancelling for totally unrelated reasons, was personally disappointed, and would visit Israel in the near future. "When Sylvester Stallone, Claude Van Damme, and Bruce Willis cancelled a planned appearance in Israel last year, BDS advocates rejoiced. But the actors' cancellation was due to the death of Stallone's son, Sage, and had nothing at all to do with BDS - in fact, Stallone and Willis had both signed a statement of support for Israel several years earlier, along with Danny De Vito, Serena Williams, Nicole Kidman, Michael Douglas, and dozens of other celebrities. "Also last year, Irish writer Gerard Donovan made a point of slapping down suggestions that his cancellation of a visit to Israel had anything to do with BDS. Explaining that he was recovering from cancer, Donovan said he wouldn't be 'bullied or cajoled' into caving to the BDS'ers' demands. 'If I had been well, I would have gone to Jerusalem,' he said. 'Nobody tells me where I can or cannot read my work.'" "The BDS Movement's tactics are clear: bully, threaten, and - if all else fails - just plain lie. The hallmarks of a failed movement."